Save $200 per person with reservation and deposit submitted by Jan. 31st, 2019! 10 Days/8 Nights - from $2099 P/P( after early bird discount with deposit by Jan. 31st, 2019)-All Inclusive with Land, Transpacific Air with Tax & Fee and Intercity Transportation in China. This promotional tour offers great value for you to see the Great Wall, Terra-cotta Warriors and experience the city vibrancy of Shanghai in one trip with all inclusive bargain prices! Interesting cultural activities such as Tai Chi lesson and tea culture presentation are also included. (For information about optional tours available, please click on "Option" of the menu bar on top of this page). Today’s excursion takes you to the Olympic Park where you will view the exterior of the Bird Nest-China National Stadium and Water Cube-China National Aquatic Center. Stop by a Jade Museum/Factory. Later in the day you will visit the astonishing Great Wall of China at Juyongguan Pass, one of the most remarkable feats of mankind. Visit a tea house to learn some Chinese tea culture before dinner time. Later in the afternoon, enjoy the complimentary foot massage for your relaxation and spend the rest of the evening for leisure. After breakfast, you will visit the UNESCO Cultural Heritage Site - the Temple of Heaven where emperors used to pray for good harvest. You will also attend a morning lesson of Taiji (also referred to as Taichi by the Westerners) exercise on the site of the Temple of Heaven given by a professional. Taichi is a type of internal Chinese martial art practiced for both its defense training and its health benefits. T’ai chi theory and practice evolved in agreement with many Chinese philosophical principles, including those of Taoism and Confucianism. After lunch, you will stop by the Silk Shop, and enjoy your free afternoon for shopping or leisure. You may also take an optional tour of Hutong (Chinese alleyways) by riding aboard a rickshaw pedicab through the narrow lanes of the old residential quarters in the afternoon. Hutongs are a type of narrow streets or alleys in Beijing, formed by lines of siheyuan, traditional courtyard residences. Many neighbourhoods were formed by joining one siheyuan to another to form a hutong, and then joining one hutong to another. Hutongs represent an important cultural element of the city of Beijing. Thanks to Beijing’s long history and status as capital for six dynasties, almost every hutong has its anecdotes, and some are even associated with historic events. In contrast to the court life and elite culture represented by the Forbidden City, Summer Palace, and the Temple of Heaven, the hutongs reflect the culture of grassroots Beijingers. The hutongs are residential neighborhoods which still form the heart of Old Beijing. Taking a Hutong tour is a great way to enjoy the local cultures, giving you a unique opportunity to glimpse into the local resident's daily life. before visiting the famed Capital Museum which showcases the history and traditional cultures of Beijing, the most important and best preserved ancient capital city in China. Attend an optional Kungfu show in the evening at the additional cost of $40 P/P with admission and transfers. 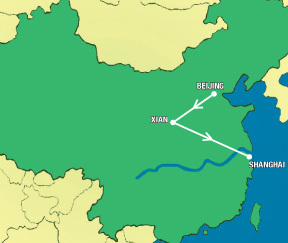 After breakfast, you will take a flight to Xian, the ancient capital city for 11 dynasties in Chinese history. Upon arrival at the airport in Xian, you will be met and taken to tour the well-preserved ancient city wall of Xian. After hotel chechk-in, enjoy some free time for leisure, before attending a dumpling dinner banquet, followed by an on-stage show of Tang Dynasty dance and music. visit the Tomb of Emperor Qin Shi Huang and see the awesome Terra-Cotta Warriors and Horses, widely regarded as the eighth wonder of the world. Later in the afternoon, drive back to the city proper of Xian for a brief tour of the well preserved Ancient City Wall if time permits. After hotel check-in, enjoy some free time for leisure, before attending a dumpling dinner banquet, followed by an on-stage show of Tang Dynasty dance and music. The excursion today takes you to visit the Tomb of Emperor Qin Shi Huang and see the awesome Terra-cotta Warriors and Horses, widely regarded as the eighth wonder of the world. After lunch, you may enjoy the rest of the day for leisure, or join in the optional night walking tour of the Muslim Street, known for the local yummy snacks and a variety of local artifacts. After breakfast, you will take a flight to Shanghai, China’s largest city and home to 20 million people. Often regarded as “the Paris of the East,” Shanghai has retained the flavor of its past European influences. Upon arrival in Shanghai, you will be met by our representative and transferred to your hotel for hotel check in. Later in the afternoon, you may enjoy your free time for leisure or take an optional tour of Zhujiajiao Water Town at $45 P/P. You may also attend an optional Shanghai Acrobatic Show, considered the best acrobatic show in China, at the additional cost $45 P/P with admission and transfers. Transpacific air with tax and fee. All domestic air and ground transportation with airport tax and fee. 16 meals: 8 breakfasts, 5 lunches, 3 dinners including Peking duck dinner, dumpling dinner banquet in Xian, and Shanghai cuisine farewell dinner party. The above air inclusive tour fares include both the land services and all international and domestic Chinese air fares along with airlines fuel surcharges, and the government imposed taxes and fees including the September 11 security fee. Additional baggage charges may apply. Reservation with above fares is subject to confirmation.For details about the baggage allowance information, please check www.airchina.us. To enjoy the above air inclusive tour fares, reservation with full payment must be received no less than 60 days prior to departure and reservation is subject to confirmation.